Crime has fallen by nine per cent to its lowest level in 32 years in England despite huge cuts in police numbers, it has been revealed. There were 8.6 million crimes last year — the lowest figure since the official Crime Survey for England and Wales began in 1981. The survey is based on crimes which are seen by the public but not always reported to police — meaning more offences are recorded. There was also good news from the official police figures reported separately by the Office for National Statistics. They show crime plunged seven per cent to 3.7 million offences and the lowest since 2002. The dramatic falls came despite 4,516 cops being axed in 2012-13 — the third year in a row of big cuts. 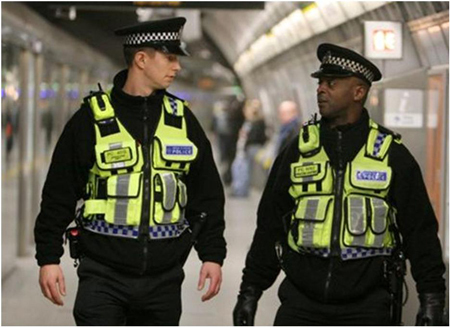 There are now 129,584 police officers in England and Wales — 14,186 fewer than in 2010. PM David Cameron, who saw cops using mobile devices on the beat in Cheshunt, Herts hailed the figures and praised police for coping with cuts. The PM said: “I want to thank them for doing more with less. They’ve performed magnificently.” ‘We are seeing the benefits’ The official police stats showed violent crimes against people fell by four per cent. Gun and knife crime was down 15 per cent, criminal damage was cut by 14 per cent and burglaries eight per cent.